No huge surprises in the Census’ reapportionment announcement this winter solstice. 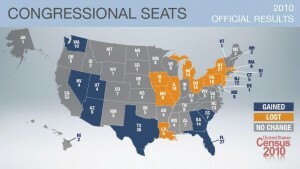 Republicans stand to gain electoral votes in 2012 simply by winning where they typically win, while Democrats are hampered by the midterm shellacking and their banishment to the redistricting sidelines in many state capitals. The real redistricting battles will take place across the Rust Belt – from New York through Pennsylvania, Michigan, Illinois and Missouri.